You know the voices; cartoons, commercials, TV and movies. But what do they look like? I'm in no way going to try and list her credits as she has literally done hundreds of things. Some well known roles include Dot (Animaniacs), Agnes Skinner (Simpsons), Mom (Futurama), Chip/Gadget (Chip & Dale Rescue Rangers), Babs Bunny (Tiny Toon Adventures), and on and on and on. She also sang with Weird Al on "Ricky." Pretty much though, if there's a cartoon, you can almost bet you'll hear her voice at some point. With all the crazy characters she's portrayed, I can't help but feel she looks too normal. You should see Sherri Stoner, who voiced Slappy Squirrel. Especially from back in her "body model for The Little Mermaid" days. I think I've seen her. I like matching voices to the respective bodies. Who is the cartoon character in the top photo? It's the normal ones you have to worry about! She does some pretty awesome voices though. She looks like she'd go incognito, then pop out a famous voice just to surprise someone. 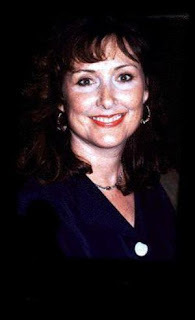 I still can't believe the voice of Bart Simpson is a woman. 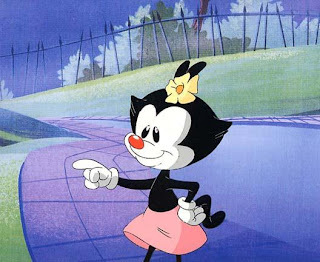 How does Pat not know Dot from Animaniacs? I wouldn't kick Tress (or Dot) out of bed. In one of my past incarnations, I used to do voice-over for animation (never on this level -- this woman is a machine!) and I was amazed by these voice actors who looked like they should be selling you insurance morphing into these fabulous elastic characters. I miss the work. Cool! You always wonder about the people behind the voices. It really bugs me when movies use celebrities for voices--I think it puts voice people out of work. Awesome post. Actually I've worked with quite a few voiceover actors over the years. I'm always so shocked to put a face to a cartoon. She was Chip and Gadget? How did that work? Maybe she recorded the voices separately, then they put them all together? Very nice, she was in all sorts of favorites growing up, and excellent pick!